Are you are thinking about making blogging a part-time or full-time job? Starting a blog offers a lot of money making opportunities. But you need to be patient, plan well and set up your new site correctly. The process of launching a new blog is a step by step process, and it will take some time before you will be earning money from your blog. My experience has been that it takes around a year before all the work starts paying off. But then the income begins to become reliable and predictable every month. I am in the early stages of starting an entirely new project. Like the sites I have launched before, it is starting from scratch, so it has very little content and next to no traffic. But the building blocks are in place, and now the work starts on slowly making the site a success. Here are four essential steps you need to take if you are ready to create a blog. A successful blog is always focussed on one topic or subject. You need to decide on your niche before you do anything else. There are thousands of ideas from animal care to zookeeping. From antique clocks to zodiac advice. Find a subject that matches your expertise and importantly, is something you will enjoy writing about for years to come. Once you decide on your topics or have a few choices, think about how you can make money. You can monetize a blog in many different ways. Advertising and affiliate marketing come to mind quickly, but you can sell a product or service or charge subscriptions. There are a lot of potential income streams, but your choice of subject will govern which ones will have a chance of working for you. For example, if you start a new blog on writing skills, you might decide to sell your services as an editor. However, you could also make money from advertising on your site. If you specialise in making designer jewellery, you will probably need an online shop connected to your new blog. Perhaps you want to start a blog as a restaurant guide. It might mean that you will need mapping functionality on your site. The decision you make about the subject of your new site is crucial because it will determine how you go about designing and building your new blog. Once you make your final decision on a topic, make a plan of what you want your site to look like and what functionality you will require. Then and only then will you be ready to build a blog. Your very first task is to decide on a domain name. You are not planning on a personal blog, so take your time and be selective because once you have registered a domain, it will need to work for you in your new business. Try to find a name that reflects your blog topic, and if possible includes a related word. Short URLs are preferable, but a longer one that includes subject keywords can work very well too. The three golden rules for a good domain name are that you must choose a .com address. Second, don’t have hyphens in the name. Third, never use a free domain name. Once you have secured your domain name, then it’s time to get started. Self-hosted WordPress blogs are the most popular because of the enormous range of features, plugins, themes and functionality. You can do almost anything you can imagine with WordPress. You will need a hosting account. Select a reliable and reputable web host that offers high-quality service and support. Bluehost is very affordable and very popular with pro bloggers. Also, make sure it offers automatic WordPress installation and set up. Most hosts offer this feature now. Quality web hosting is generally inexpensive, so don’t go for the cheapest. You are going to monetize your blog, so your small investment in top quality hosting will be repaid a hundred times over in the long run. Your hosted site should cost you less than $150 a year including your new email address, plus about $10 for your domain name. Once your site is online, and you access your wp-admin dashboard for the first time, you are ready to start building your blog. You will need to do a lot of experimenting, so the first thing you should do is install a maintenance page plugin. I use a free page plugin from Themegrill, and it works perfectly. Use it to say that your site will be online soon. You can add a small announcement plus your social media accounts and contact information. Then you can feel free to try out free themes and work on your site design without anyone watching what you do. Don’t worry if it takes you a long time to get your site looking just right. It will be worth it. But I would advise you to consider using a premium theme in the end because they always offer many more design features and a lot of extra functionality. Fo my new site, I tried ten different free themes. But once I had decided on the best one, I bought the premium version. When your site looks perfect, you are ready for your first day in the office. It’s time to write a blog post. Writing quality content is the only way to succeed in blogging. You can try all the tricks to drive traffic to your blog, but if your content is weak, your blog will fail. All your blog posts have to be informative, well-written and grammatically perfect. There are no shortcuts to producing quality content for your new site. Once you have ten or so articles published on your site, it is time to remove your maintenance page and let the world see your new site. But no one will know about it. So what do you do? First, install an SEO plugin like Yoast SEO or All In One SEO. Both of these are free and include a sitemap feature. Then you can add your sitemap to Google by using Google Search Console, and on Bing Webmaster Tools. Now your site pages and posts will be indexed by Google, Bing and Yahoo. But don’t expect overnight miracles. It can take weeks or months for your indexed pages to rank high enough to get any organic traffic. If you want to give your site a little nudge, you can always use social media while your organic rank is in its early days. At this stage of your new blog, the most important work you have to do is to write content and lots of it. As a general rule, a new blog will only start getting reasonable ranking keywords from search engines when the site has more than fifty published articles. If you think that blogging is a get rich quick business, you are wrong. Like any business, the harder you work at blogging, the luckier you get. To start making money from a blog, you need traffic and ranking keywords. Here is a week by week graph over nearly two years of one of my blogs with data from my Semrush account. As you can see, the first months were very slow to climb, but then the growth starts. Peaks and plateaus and ups and downs are always going to happen. But over time, there is continued growth. 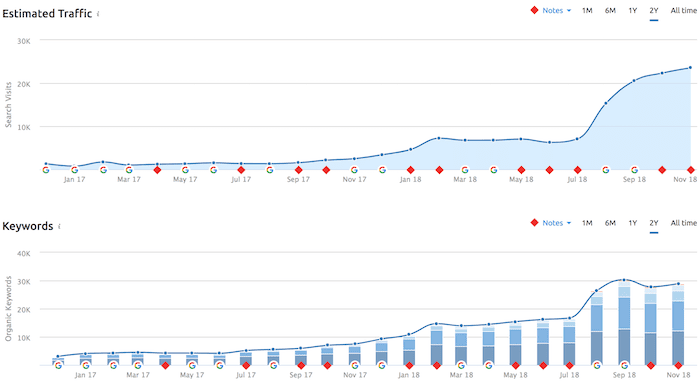 The big jumps in the graphs were a result of adding a lot of new content that was targeting new keywords. Until your site can attract regular traffic, advertisers and affiliate programs are not going to be very interested in approving your site. As a rule of thumb, you will need around 10,000 sessions per month before you start to see some money coming in. If you want to join Google Adsense, you will need to show a track record before you can expect to be approved. The same applies to many affiliate programs. But once you solidify your organic traffic, you might be surprised to find that affiliate programs approach you. You can’t make money in any business without potential customers. With blogging, your visitor traffic is your potential customer base. The more traffic you can get, the more conversions or sales you will make. At around 20,000 organic sessions a month, you can expect to make a reasonable amount of money from your ad networks and affiliate links. The same goes for selling your products or services. You might be lucky to get one sale from 1,000 sessions over a month. But from 30,000 sessions, you should be making 20-30 sales each month. It is a simple equation. You need a lot of organic traffic from Google, Bing and Yahoo to make a living from blogging. So your primary focus must be on writing high-quality content very regularly and working on improving your ranking keywords. If you do that, you will be a successful blogger. There are no quick fixes or shortcuts to building a great blog and to making a part-time or full-time living. But with patience and hard work, it can be done. Any time you come across a successful blog, always remember that it too started with zero traffic. It depends on you, and how much effort you put into it. In the beginning, you can take your time and get the basics right. Then move onto adding great content, and getting more traffic. Then you can start on the stage of monetizing. Another factor to think about is using the best tools to improve your chances of success. For me, there are two tools that are indispensable for me now. I use Grammarly to help in making my articles as error-free as possible. You can use the free version, to begin with, but the premium version offers much more capability. My other must-have tool that is used by a lot of pro-bloggers is Semrush. It is an SEO suite of tools that allows me to find ranking keywords and to do competitive research. It also has a lot of content analysis tools that can help me improve the SEO value of my articles. But it’s not free, so you will need to consider this option carefully. Is it possible to make money from blogging? Yes. There is nothing to stop you if you are motivated. But always think of it as a business, and be ready to invest a little money and a lot of hard work. Then you will have a good chance of becoming a successful, and profitable blogger.